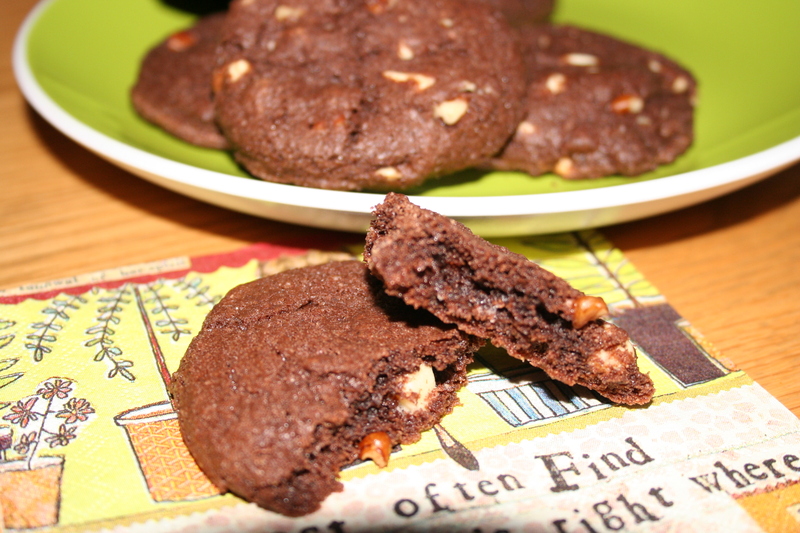 If you are looking for a gluten-free cookie to make this March break and you like a little chocolate then these Triple Chocolate Cookies should be a hit. They took very little experimentation to come up with a gluten-free version of the original recipe. I just switched my gluten-free all purpose flour mix for both the wheat flours and added 1 teaspoon of xanthan gum and 1 Tablespoon of sour cream. I made a double batch so I could share but they were so good they disappeared before they could be delivered to the deserving parties! These are a hit with the chocolate lovers and I have found they disappear quickly from a plate of assorted cookies. You can bring these to a party and not have to apologize for being gluten-free! •	Beat margarine with both sugars until smooth, being careful not to over mix. •	Add egg, vanilla, coffee and sour cream, beating until incorporated. •	Sift flour, xanthan gum, baking soda, salt and cocoa powder into sugar mixture and beat until smooth. .
•	Add white and dark chocolate and pecans, stirring until evenly distributed. •	Drop by dessert spoon or 7/8 oz scoop onto an ungreased cookie sheet and flatten slightly with the palm of your hand. •	Bake for 10 -12 minutes at 365°F. •	They are done when the tops begin to crack and centres are somewhat set but still a little soft.